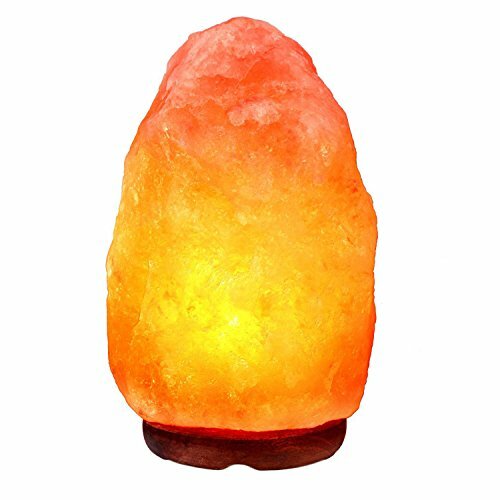 Unique salt lamp is made of Natural Himalayan salt crystals hand mined in the Himalayan Mountains. Due to the natural features of Himalayan Crystal salt, the weight, size, color and shape of each may vary. So the slat lamp you received may be different from the pictures showed in the listing. The salt lamp bulbs are consumables goods, you can buy replacement bulbs from us. When adjust the light of the bulb with the dimmable switch, please slow down the adjusting speed to prevent it burns out and prolong the service life. 1,Crystal salt lamps can distribute natural negative ions, especially in the heated state, which can effectively balance the amount of positive and negative ions in the air, is a natural air purifier. 2,Radiation protection: Salt light can be released the called "Schumann wave" frequency after lighting, and can naturally adjust and suppress the high frequency electromagnetic waves generated by electrical appliances. 3,Purify the air, remove the bacteria: salt lamp can remove the smoke and odor in the air; absorption, removal of dust, pollen, microbial spores, bacteria and so on in the air. 4,Relieve stress: The kind of soft light is released by Salt lamps, can effectively alleviate people's psychological gray state, to create a comfortable space environment for you. 1, We use the 12V circuit to ensure that the power consumption is very small. 3, If you do not use salt lamp for a long time, please wrap the plastic bag, keep the air, prevent it from starting dehumidification function, causing moisture dripping water, and then dissolve salt. Lamp, base, 15-watt bulb, 6 ft long UL-approved electric cord and an instruction manual. HANDCRAFTED&HIGH QUALITY - Made of 100% authentic Himalayan natural salt crystal, delicate hand-carved, good transmittance, pinkish orange color, UL Certification. Every lamp is unique and individual, three sizes: 6"-7"/7"-8"/9"-10"
If you have any questions about this product by NatraLamp, contact us by completing and submitting the form below. If you are looking for a specif part number, please include it with your message.